Looking for marketing data for your marketing campaigns in North Carolina? 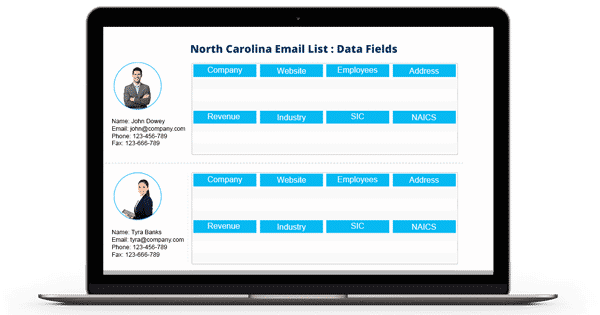 Blue Mail Media provides highly accurate North Carolina Email database covering businesses and executives in this region to help you power your sales and marketing teams. Our North Carolina Mailing List provides marketers with access to comprehensive marketing information to engage with their target audiences via email, mail or telephone. Blue Mail Media has been able to develop a strong data repository pertaining to wide-ranging business, C-Level executives, and thousands of professionals across North Carolina. Whether you are looking for new business engagements or simply networking opportunities, our North Carolina Email List can be your perfect strategic resource. Keeping up with our clients’ marketing aspirations, we offer pre-packaged as well as customized Mailing Database of North Carolina Business Executives. Marketers can customize their database from a range of selects such as job Role, SIC/ NAICS code, the size of operations, employee strength, among many others. Using our North Carolina Business Email Database, you are sure to gain a competitive advantage in terms of expanding your business in the region.